Omah's Malaysian Cuisine is permanently closed and no longer trading. Welcome to Omah's Malaysian restaurant, home to delectable, mouth-watering Malaysian food and the best Mud Crab dishes in Melbourne. Omah's interior design has drawn inspiration from the 1950s Malaysian tea-houses. Beautifully hung bird cages serving the role of both décor and chandelier along with the teak wood furniture is guaranteed to fill you with awe. The contemporary look brings back forgotten memories of the 1950's Malaysian tea-houses. The lights are quite dim giving the place an intimate ambience without darkening up the place. The waiters are welcoming, courteous and respectful of your privacy allowing you time to decide on your selections and leaving you alone to enjoy the company of your lunch or dinner partner(s), once you have ordered. The exquisite and extensive menu will leave you lost for options. The entrée includes Soft Shell Crab, Tempura Oysters, Yam Scallop and many others. The Yam Scallop is a winner and will leave you tastebuds craving for more. But don't binge on the entrées, wait for the delightful Mains. The mains menu is divided into numerous categories including 'House Specials', 'Seafood', 'Poultry', 'Beef and Lamb', 'Noodle and Rice', 'Salad, Veg and Tofu'. There is also a Junior menu and a Sides menu. You have been cautioned! Be prepared to be drooling incessantly as you run your eyes over each item on the menu. The Special Fried Rice is definitely worth a mention. It is beautifully done and is a generous blend of rice, seafood, chicken and vegies. However, the mud crab dishes, listed in the 'House Specials' menu, are by far the best creations of Omah's. Fit for a King, the Chilli Crab is enchanting. 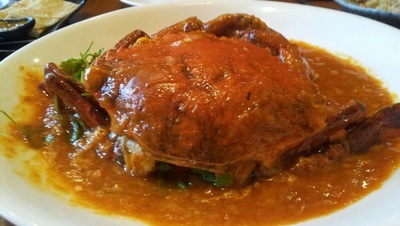 The crab is wok-fried in semi-thick, sweet and savoury tomato and chilli based sauce. Do not be misled by the word 'chilli' in the name. This dish is not hot by any means but has a pleasant kick to it. The lovely aroma will instantly entice your nostrils and tickle your senses. The mud crab is huge and you may need some assistance in finishing it. The flesh inside the shell is soft, juicy and delicious. Do not forget to order some rice to soak up the mouth-watering, thick gravy. The Salted Egg Crab is another must-have item in the menu. The salted egg lends to this dish a savoury, yet subtle flavour. You will be licking your fingers profusely as you will savour the succulent crab meat and the accompanying fried egg. You may require quite a bit of time and assistance to finish these yummy dishes. For those who don't find seafood that appealing the 'Poultry' and the 'Beef and Lamb' menus are the way to go with a wide array of selections ranging from Omah's Duck to Crispy Battered Chicken, from Honey Black Pepper Beef to Crispy Beef. For the vegans and the vegetarians Omah's offers the 'Salad, Veg and Tofu' menu. Take your pick from the delicious Shiitake Mushrooms & Tofu, Gado-Gado and others. You can also choose from the Banquet Menu and the Set Lunch Menu. You would also find the Dessert menu highly tempting. Omah's boasts a tastefully decorated bar offering an extensive list of wines, cocktails and other alcoholic beverages. The knowledgeable and friendly bartenders are always prepared to assist you with your selections. Omah's has branches in Hawthorn and Port Melbourne. And it will be wise to make a booking for your wonderful lunch or dinner to ensure availability of the dates and your preferred dishes. Good value for money, Omah's is undoubtedly the ultimate destination for delightful, scrumptious Malaysian cuisine. Come and enjoy the exquisite menu, entice your tastebuds with the delicious mud crabs and try the wide array of cocktails and wines. You will leave with a satisfied smile, a full stomach, a great taste in your mouth and a spring in your steps. Apparently Omah's is now closed - probably a good thing from the reviews posted!